As mentioned earlier in the week, I have a few more tulip/flower shots I will be posting! Here’s another HDR image, I think I am getting the hang of it! 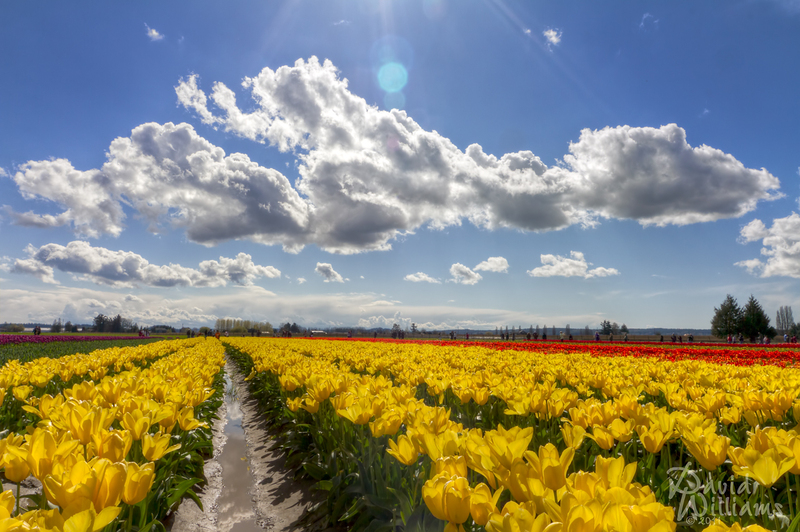 This was taken last Sunday at Tulip Town, Mt. Vernon Washington. Cait and I plan on heading back out to the fields in the next week to see what we can capture (have I mentioned how much I LOVE heading out on photo walks with her?). Note: The Lightbox version looks way better! Are you allowed to go in the fields there? All of your photos are so close like your standing in the field. Great colors by the way! Hi Morgan. We are allowed to head two to four feet into the fields (of course, people don’t pay any attention to this). I was standing perhaps two to three feet in. Wow! what an amazing town this must be! So many colourful flowers, and the sun compliments the field so beautifully! I bet there are tons of beautiful bees too! Thats such a beautiful composition. Love the sun on the yellow an the reflection of the sky. Thank you Martina, we had a really good day! Thank you Jolene, we do get sunny days here and there!